In the early 1970s, the automaker BMW’s brand was symbiotically linked to left-wing terrorism in the company’s native West Germany. 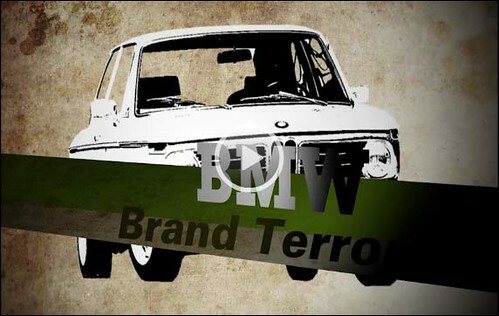 BMW/Brand Terror explores how BMW came to be connected to terror. BMWs became so strongly associated with terrorism that a common joke emerged among Germans: “BMW” didn’t stand for “Bavarian Motor Works” but instead stood for “Baader-Meinhof Wagen” after the notorious Baader-Meinhof Gang that was waging war against the German state. BMW/Brand Terror was created by Richard Huffman, who has become one of the world’s leading experts on this arcane era of German history. Huffman’s father served as the head of the US Army’s bomb disposal unit in Berlin in the early 1970s, and defused several terrorist bombs, including one meant specifically to kill him. It is this family history that inspired Huffman to learn more about the Baader-Meinhof Gang, the June 2nd Movement, and other radicals who waged war on the German and American states in the 1970s (source). Long, but an interesting watch if you have fifteen minutes or so. ~ by velofinds on January 15, 2013. Wow, I wasn´t aware of that.